To join the game, send an email to mystara_dm@yahoo.com – I may ask you to submit a character, or create one based on what best may fit what’s going on in the game. When adding a character to the game, I’m especially looking for an interesting backstory and unique personality, so keep that in mind. The campaign takes place in Mystara, which is an old TSR game setting. For building characters that will fit in, I recommend using this Mystaran character builder tool. It’s also useful for getting more knowledge about the Mystara setting. Below are the current character record sheets. Though this game will not be rules-focused, we are using rules. Specifically, the OD&D Rules Cyclopedia. If you’d like more info on that book, you can purchase a pdf of it here. I will try my best to keep them updated. Characters were built using this Mystaran character builder tool. It’s also useful for getting more knowledge about the Mystara setting, so check it out. Personality: Miklos is young, studious, and uncertain but fairly happy-go-lucky. His attitude is a product of a sheltered upbringing – he’s optimistic mostly because he’s never truly faced serious hardship. He rarely gives serious thought to preparation for a task or social engagement, preferring to improvise. Background: Miklos’s family has had its ups and downs. Before the coming of the Thyatians, the Dostevars were minor Traladaran nobility, allied with the Radu clan of old Specularum, and joined that clan in its decline after the coronation of Duke Stefan. Most of the family presently lives in genteel poverty, and are driven mainly by resentment of the crown. Some are believed to have rebel sympathies. An exception to this decline is Miklos’s father, Ilya. Always the black sheep of the family, Ilya took advantage of the Thyatian upheaval to break all ties with his kin, allying himself instead with the Vorloi merchant family. Through hard work and natural talent, Ilya became a prosperous merchant. His children gained access to opportunities that many Traladarans could not afford. In Miklos’s case, he received tutoring in scholarship, and eventually magecraft. Under his demanding master, Nerissa Acrision, Miklos quickly developed skill in the use of arcane magic. Nerissa also provided him with social contact among members of Specularum’s fledgling Mages’ Guild, providing Miklos with a worldview beyond the coin-counting ways of his family. Miklos has recently been Sheared in accordance with Traladaran tradition, and is looking towards a year of living on his own without support from family or the Guild. Personality: His zealous intensity can seem like fanatacism–and there’s probably some truth to that. He cares deeply about his culture and does not brook insults. He considers dwarves higher on the cultural scale, and delights in showing lesser races the glories of the dwarven way. He is proud of his people’s vigil against the savage humanoids, and the thought that they might be anything more than a plague to be expunged is akin to heresy. He delights in violence as much as he does in craft and those who excel in either are objects of admiration. Truth be told he has a ways to go toward becoming competent in either area himself–and though he is aware of this, his pride forces him to make the best showing for himself he can, and drives him relentlessly to improve. Background: Feldard was engaged to be married to Hernane, the daughter of another family. Very unhappy about the arranged marriage, she ran off. Her father, worried sick, blamed Feldard’s father. To avoid a feud developing between the two families, the heads of the clan asked Feldard to find her. He heartily agreed, and looks forward to the opportunity to try himself and demonstrate to the outside world the virtues of Dwarven society. Equipment: Plate Mail enameled with Halavist symbol, belted, and padded under tunic (slightly fire damaged), Halavist Ceremonial round Shield (slightly fire damaged), worn on back with a strap, Mace +1, Shield+1, Footman’s Flail on a belt loop, Halavist Symbol on a silver chain, Money pouch on a cord around neck, Cot (a type of light t-shirt), Fine Belted Tunic (a longer version of a cot), travel Over-robe (a cleric fashion statement). A shoulder strapped bag containing: A spare cot, Fine Halavist Ceremonial over robe and fine tooled leather, belt , waterskin, second hand copy of the Halavist Manual of the Seasons, Halavistic Augury Runes, 3 earthenware flasks containing Holy Water, 3 vials of oil, 3 vials of holy water, Cutlery (wooden spoon, bowl, cup, sharp knife etc. ), pouch of medicinal herbs and salt, leather sling and a selection of stones (for hunting), Flint & Tinder, Iron Rations. Background: At the age of 5, Maruc was sent away from home by his mother. Maruc knew nothing of his father, his mother never mentioned him and he’d not wondered about it until it was too late. He was adopted by a Halavist Church in a small, out-of-the-way village. Widely known in Karameikos as the Cult of Halav, the church is a controversial sect of Traladaran Church that believes that Duke Stefan is the Immortal King Halav reborn. Maruc was raised by his adopted Reverend Father to be a cleric. Recently, the village and church were destroyed by fire. Maruc survived, accepted his fate as a test by the Immortals, and now seeks to travel and spread the good word. Equipment: Sword+2, Shield+1, Longbow, Chain Mail, Jade Ring of the Elyan, 2 Arrows+? Personality: Hasan is both curious and wary of the outside world, which for him is everything beyond the deliberately-isolated village in which he was born. Magical gifts and a chance meeting with outlanders left him in position to save his village from the existential threat posed by the takeover of its temple by evil forces. In that adventure, his eyes were opened to the clan’s more open and prosperous past. He now seeks to journey far and wide, to understand better the choice his forefathers made to seek solace, what they called the Quiet Way, in the solitude of their Radlebb Forest lands, and perhaps to find the knowledge and power needed to restore his clan to its past. Hasan loves little more than to be alone, hunting, trapping or woodworking in the forest lands he loves. However, earnest about developing his natural leadership skills, Hasan can become a bit overbearing in groups. Also, because of his commitment to leadership, Hasan often finds himself making decisions faster than he believes wise. Background: Hasan is betrothed to Rahasia, daughter of Elrond, the former clan leader of the Elyan. On their marriage, he will take up that leadership role. Hasan wears Ring and Golden Pendant of Elyas, having received the ring in his betrothal ceremony and recovering the pendant deep in the overtaken village temple. Hasan has yet to discover what powers these artifacts have beyond their important symbolism to the clan. Personality: Friendly, brave, honest. Stephan is the salt of the earth. He loves children but never married (of course, one would never have children out of wedlock). While not overly boisterous, he does enjoy drink with good friends and a good laugh. He has been known to break into song usually singing long ballads of heroic deeds and lost love. Notables: He wears a small neck pouch in which he keeps two keepsakes sacred to him: a bit of soil from his boyhood farmstead of Sukiskyn and a small statue he found as a youth. Deeply superstitious. Faithful to the Immortals, especially Halav to whom he performs a short ritual at least once a day (in addition to frequent Halavian genuflects). Appearance: Height: 6′ 1″. Weight: 175lb (12.5 stones). Nondescript but with large, kind eyes. Brown hair and eyes. Large, strong teeth. Numerous scars on hands and arms. Part of left ear is missing. Pale skin (sunburns easily). Background: Farming and horse ranching with family. Basic infantry. City guard. For his “shearing”, Stephan set off at the witching hour with only a hand knife and the clothes on his back. He headed to the Black Peak Mountains. His goal was to see the Kingdom of Karameikos from the highest point. After two and half years and a route that took him in no way directly to the mountains, Stephan stood atop Mt’a Ihkhara, shivering in the wind. After drinking in the saga of mountain, stream and wood layed out before him, he looked at his own boots marveling at the path they’d tread. And there next to his right boot lay a strange little statue carved out of rock. Intricately carved, it depicted a tall, slender humanoid creature with a jackal-like head dressed in robes. It appeared to be quite old—an ancient relic of some long-forgotten time, perhaps. He was 17 years old. The journey back is not something he likes to talk about. Over time, the little statue preyed on his thoughts. The odd markings on the bottom suggested some sort of message. Or maybe it was simply the artist’s mark. He is driven to find out the origins of the statue. Stephan is no stranger to battle. He has served as infantry in the Duke’s Army and city guard in Threshold. He has fought goblin, orc, ogre and even troll (from which he sustained a serious wound on his left side—a 10″ reddish scar is evident). He once encountered a gelatinous cube and still has nightmares about it. To this day, Stephan cannot eat anything having a gelatinous consistency. The youngest of six sons of a minor noble, Ludo realizes that he is not going to inherit anything from his father whom barely acknowledges his existence. 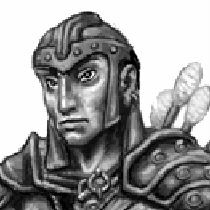 Even though he is educated (in that he can read and write quite well), can speak a spattering of Elven and a number of other languages Ludo acknowledges that he was destined to become a cleric, an officer in his fathers guard or have to become a merchant if his father had his way. Ludo is a carefree individual and is looking for challenges in his life. He is also a bit of a revolutionary and he feels guilty for the manner that the serfs and peasants that he sees everyday in his sheltered existence are treated and wishes to punish the people that take advantage of their wealth and status in life. Ludo would have joined the clergy, he prays regularly, but he sees the clergy as being part of the problem of the way that the masses are kept in their place. To be honest, except for the piety that he sees the clergy practicing in cloisters, he has little time for clerics and their ilk with organized religion. Ludo believes that the aristocracy should be punished for their arrogance and has taken to becoming a cat burglar and master locksmith to remove their wealth. In his naivety, Ludo probably thought that if he was caught his father’s connections would protect him from harm and the law. In this he was correct, because after he was caught for burglary and flogged in the public arena his fathers connections had him transferred to a departing caravan leaving for Specularum as a caravan guard. The last words from his father were of scorn “I don’t care that you became a thief – I am just so disappointed that you were caught and have bought shame on my family”. “If I could have I would have given you to the Iron Ring, now get out and never cross my threshold again”. Ludo has not yet even participated in the shearing ceremony and has been cast out of home and exiled from his family. As soon as Ludo arrived in Specularum and was paid off by the caravan master, he found himself at loose ends. The demise of the Veiled Society have left numerous minor thieves guilds vying for the top position and Ludo as an outsider trying to practice his trade quickly found himself hunted both by the city guard and various unsavory characters. Ludo decided that his best course of action was to vacate the city and he headed out of the city along the Dukes Road towards Kelvin with the plan that life on the frontier will provide him with opportunities. Ludo’s attitude and demeanor is that he is young and brash, liable to take calculated risks (in his mind) and thinks he plans everything through. He doesn’t see himself as a common thief but as a thief that has morals and enjoys the challenge of redistributing the wealth of people that can afford it. He is reticent about his past, but is very keen to make a good impression with people that he meets. Ludo is 17 years old, swift and light. He weighs in at 70kg, his height is 5’9″, and he is left handed. Typically he is armed with a short sword, and uses a dagger as a parrying weapon. He has leather armor. Personality: While not quite as innocent as many elves, Saeth maintains the aloof, timeless attitudes that typify her elven brethren.Her interest is not in work or material gain, but in amusement and gaining a wide breadth of experiences for herself. She intends to use the latter to write an epic poem, though her battles in the north have lent her writing a cynicism, a dark tone that will not appeal to the elves. Background: Born in a Callarii village in Karameikos, Saeth was raised as much on poetry and the arts as on fish and bread. Even before she turned 50, she could quote dozens of poems from memory, and her father took great pride in the fact that she was chosen as an apprentice to the village lorekeeper. He came to regret this before Saeth reached adulthood. Hearing tale after tale of heroism and glory whetted the young girl’s appetite for adventure, and she resolved to write her own tales rather than merely reciting them. As soon as she reached adulthood, she blithely left home over his protestations, wandering northward to the turbulent lands of Darokin. There she flitted from job to job for a time, from caravan guard to court poet to mercenary to translator. It was during her stint as a mercenary that she was wounded; an orc raider in the northern reaches of the Republic took her left eye with his spear, and would’ve taken more if Saeth’s fellow mercenaries had given him the chance. Disillusioned with one job after another, she often wondered where she will find the inspiration for her great poem. Finally, it piqued her interest to return home to Karameikos, where she would join the elven brigade in Specularum—are they not the heroes of a great many tales? Personality: Nicolai doesn’t say much, and tends to keep to the shadows, where he feels more comfortable. He is very self-conscious about the scars on his face, and would be quite handsome if it wasn’t for them. He is also desperate to avoid staying on Fogor Isle and probably ending up in a convict gang or being a bandit somewhere, as he realises that these are not very good career choices. Background: Not so much orphaned as “lost” by his Traladaran parents. Nicolai learned to survive on the streets of Fogor Isle, scavenging and stealing the odd coin for food, but was still on the end of more than one knock or, on a couple of occasions a knife, resulting in a rather interesting set of scars on his face. Unfortunately, he was caught trying to pick the pocket of an elderly, but still vigilant, Cleric. Being so young, Nicolai was given probation, and ordered to either start living in accordance with the law, or be sent to prison. Added pic for Hasan. Hope ya like it. It might be helpful to update the current hp’s and spells on the side-column. Updated with new character Stephan. I’ve been sending E-mail asking you if I could play, if your really annoyed just tell me but i wanted to make sure they were coming through. Looks like my Yahoo sent your messages to my junk mail folder. Sorry bout that! I’m keeping the game to 6 characters (Paul who has been playing Hernane is joining as the 6th slot). However, if something opens up I will be sure to email you. I have not looked over the Stephan character in a while. I really should do that more often. Didn’t Stephan know the word on his small statue? And that word activates it or something? I think it was just a small Hutaakan artifact, but maybe I’m forgetting something. So many posts!